Deaf dog: Casey, a 5 year old Dalmatian, who loves being with people. Her dad writes, "She sits, sleeps, and eats like human beings do. She always give 100% eye contact when people sign. An outdoor dog, she loves to go swimming, boating, walking, or riding on the back of the truck. She's such a smart dog and a very adorable one!" Human companions: Steven M Barbin; Casey's 2nd master Kim Senter; and Steven's girlfriend Danielle McClurkan. Other pets: Casey grew up with 2 cats, Spooky and Beggar (Beggar is now deceased.) She has a housemate, a black Labrador dog (my roommate's dog). Deaf dog: Gidget is a one year old Australian Shepherd. Her guardian writes "Gidget loves to herd the boys. So much so she needs some more training to curb it! She also loves to go on walks. She will bring the leash to me and follow me around the house till I take her on a walk. Gidget also loves her compressed rawhide bones. She will chew on them for a while and then she carries them around the house whining trying to find the perfect place to 'bury' them." 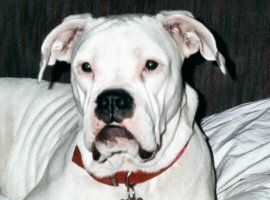 Deaf dog: Dottie is a 2 year old American Bulldog, who was born deaf. She is extremely smart and sweet. She has never met a person/cat/dog that she doesn't like. Her favorite activity is going to Pets Mart to shop lift toys. 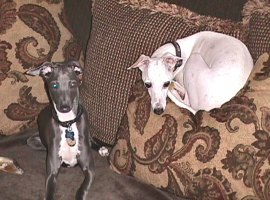 Deaf dog: Duke is a full grown Italian Greyhound. So many people ask us if we knew Duke was deaf before we brought him home - Yes, we did. 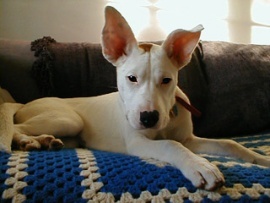 We initially were wary of attempting to raise,	train and live with a deaf dog. But, now if we had the opportunity to do it again, we would not even have to think twice about it. He is an essential member of our family and we cannot imagine our life before him. He has actually been easier to train than our hearing dogs. You just have to be consistent and creative. For example, we hung a bell on our door knob and taught him to hit it with his paws to indicate to us that he needed to go outside to potty. He has very keen senses, is extremely smart and lovable. Do it again, you ask?....in a heartbeat! Other pets: Other family members include Bailey (left) and Candy(a terrier mix, not pictured). AKA the GRAND-DOGS (as referred to by Erica's parents). Deaf dog: Lucky is a 9 week old Australian Shepherd. Lucky is only a puppy. We saw an ad in the paper for an Australian Shepherd, blue merle, with only one eye. I went to go look at him and instantly fell in love with him. It wasn't until I got him home and played with him for a few days that I started noticing he wasn't "hearing" things. So through this site and others I have found the resources to live and love my Aussie. There is support out there. Deaf dog: Olive is a 6 month old Pit Bull mix. She was rescued from the local pound. She is sweet, smart and fiercely determined. Her most recent feat is opening the front door to follow me outside. Haole (pronounced "How-lee," a Hawaiian term for white or Caucasian) is a 1.5 year old Australian Shepherd (est. born 5/00). She was found dumped by the side of a busy road in San Antonio when she was about 3-4 months old. Her rescuers had her spayed and vaccinated, but the family could not keep her due to severe allergies. After I fostered her for awhile, I just could not let her go, although I had not planned on adopting another deaf dog after losing Cotton. 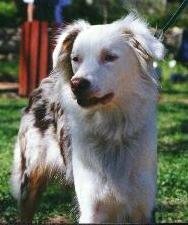 Haole is deaf because she is a "homozygous merle" Aussie, which means that both parents were merles. 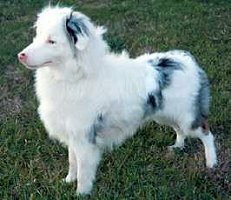 In this type of breeding, 25% of the offspring will have the "double merle" genes and will have excess white color, and often deafness as well as vision/other problems. At this time, Haole's vision is fine. 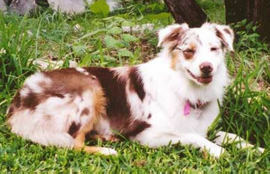 Cotton (12/98-6/00) was a special girl, a deaf red merle Australian Shepherd from strong working lines. She has 13 Working Trial Champions in her pedigree, including both sire and dam. 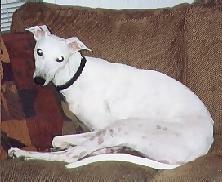 Excess white/lack of pigmentation on her head caused the deafness, but she was NOT from a merle-to-merle breeding. I rescued her when the breeder decided to euthanize the deaf puppy. I am grateful they gave me the chance to provide a home for Cotton. She never believed that she was missing anything, and lived life to the fullest. In every way she was as beautiful, intelligent, intense, and agile as all the others in her litter, and was a wonderful example of the working Aussie. I communicated with sign language as well as I do verbally with the other dogs. Cotton always continued to be independent, although she was also very loving to me and others. She was a dominant girl, and was able to convey that easily to any other dog, particularly if they came too close to me or to her crate. With her friendly temperament, people would meet her and always comment on her beautiful blue eyes. I'd explain that she was deaf, and why. I also told them of her strong working background. They'd be amazed and say that "you would never guess" that she was deaf. Cotton was a wonderful companion, always a thinker, and always doing what she wanted to do. A freak accident (running into a pole) caused her spinal column to compress, and a vertebra was pushed up over the one behind, severing or shredding the spinal cord. With less than 1% chance of recovery, and due to the pain she was experiencing, I had to send Cotton to the Rainbow Bridge. We had a wonderful 18 months together in her short life, which ended so suddenly. she taught me that deaf dogs have normal lives, and you don't have to be an expert to learn to communicate and work with a deaf dog. Thanks, Cotton - I miss you! 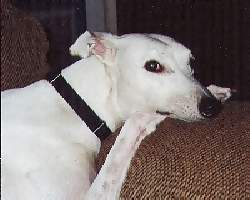 Deaf dog: Sarah's owner writes: Sarah was adopted through GALT (Greyhound Adoption League of Texas) from her foster home, where she was placed after being rescued from the track, although I'm fairly sure she never raced. I was planning on adopting a greyhound, and Sarah's adorable picture on their website and the fact that she was deaf caught my attention immediately. 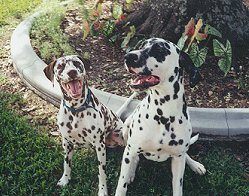 I did a bit of research, and determined that having a deaf dog would not be any more difficult than having most any dog. One of my previous dogs was from a very abusive home, and I felt that the patience and time it took to have him trust again and settle in to a normal life and routine was probably good practice for Sarah. Sarah is absolutely the sweetest and most loving dog imaginable. She is very affectionate, and loves every person and every dog she's met. My other dogs were a bit puzzled by her at first since she reacted a bit differently sometimes than they expected, but overall the transition was smooth. She's still pretty puppy-like, so she tends to be clumsy and hyper sometimes, but mainly she just likes to lay in my lap, get petted, run around the back yard, and then SLEEP! I've not experienced any real problem with her deafness other than sometimes having to track her down in the yard and let her know it's time to come in. I've been in touch via email with a deaf dog group in Texas, and they've been very helpful and interested in Sarah's progress. I'm very glad I found Sarah, and the fact that she's deaf is just a minor detail in our lives. Deaf dogs: Popcorn and Marshmallow are littermate sisters. Both are deaf. Popcorn is blind in one eye and Marshmallow is completely blind. They were born with the no-pigment, underdeveloped eyes so common among Aussies. They were taken to a kill shelter at two-three months old but luckily Large Breed Rescue and Mixed Breed Rescue found and saved them. I was told the mother was a Pyr and father was an Aussie. We teach Popcorn sign language. She knows "sit" "lay" "come". We are also currently training with a V-collar. Marshmallow knows tough signs for "come" "sit" and "lay". For a couple of deaf pooches with one eye between them, they sure make good watch dogs. Bark, bark, bark when they are in the yard and the neighbors cat is watching them from afar. Their sense of smell is keen. They are extremely sensitive to vibrations in the walls and floors (often another way we contact them - stomp, stomp). They sleep next to the fence and next to the doors in the house so they know just when we come home or want them to come inside. They are wonderful, smart and beautiful girls. I can't believe somebody out there didn't want them. Deaf dog: Britches is a 1 year old Australian Shepherd. " I got Britches outside of a Wal-Mart. She was free and the cutest little thing I have ever seen. We really have to watch out for her. Sometimes I really do think she understands us. There is a pic of her on my website. But she is the sweetest dog. In some ways she is better than my other dogs, who can hear!!" Human companions: Kelsey Baranowski and her sisters Kristen and Katy. Other pets: Fritz, a Lab mix and Sissy Bug, Joey and Angel, all Chows. Deaf dog: Smores is a 2 year old liver brown Dalmatian who acts like a real deaf person. Her mom says, "She's such a small dog which makes her unique in her size. She is a very gentle people-dog and demands attention all the time. She loves to meet new dogs and make friends with everybody." 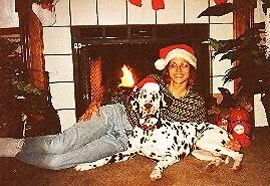 Other pets: Mask, a hearing Dalmatian/Great Dane mix. Deaf dog: Panda is a 2 year old Spitz mix. 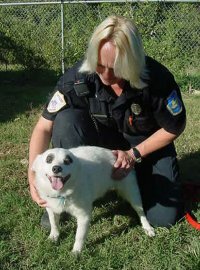 "Panda was trapped in Bastrop County and I adopted her from the Bastrop Shelter. I am an Animal Control Officer and run a shelter of my own. Panda is very good with kids and assists me in Dog Bite Prevention, Halloween Safety and other school functions. Nursing homes too! She loves to ride in the dog truck with me. She will not take her eyes off me. I occasionally leash her for her safety. She's absolutly amazing. Everyone knows if they see Panda I am not far! We didn't know exactly how deaf she was until I adopted her and began working with her. She hears absolutely nothing." Human companions: Ethel and Alan Spence, daughter Keri, son Andy and foster daughter Jessica. Other pets: 2 cats, Y.P. and Big Kitty; 2 dogs, Wrangler and Sunni, both rescues; and 8 horses.